I love breakfast. I'm one of those people who could eat breakfast food for any meal of the day. In fact, I can't understand people who don't eat breakfast. I think they're missing out. I've had a pretty bad cold for over a week now, and the only thin that sounds good to me for breakfast is a bowl of steel cut oats. They feel good on my throat. However, I don't eat them sweet, and I know a lot of people think that's really weird. So, if you want to be a weird old spinster, too, I thought I'd share my recipe with you today. 1. Start cooking the oats. Follow the directions on the canister. I use the microwave version because it's faster, and I dirty less dishes. I like to crack my egg into a mug before I add it to the pan. This way, I know I won't get any shell in the pan. I also season the egg with salt, pepper, and garlic powder before adding to the pan. 3. Add Egg to Pan. While the oatmeal is still cooking, start frying your egg. 4. Take the Oatmeal out of the microwave. While the egg is still frying, take the oatmeal out and stir. Add Salt, Pepper, Onion powder, garlic powder, and a splash of worcestershire sauce to the oatmeal. I don't measure anything out, I just add things in. Try not to add too much worcestershire sauce, though. You only need a splash. 6. Finish frying the egg. I like my eggs over medium for this. Mostly cooked but with some egg goo. 7. Add the egg to the oatmeal. 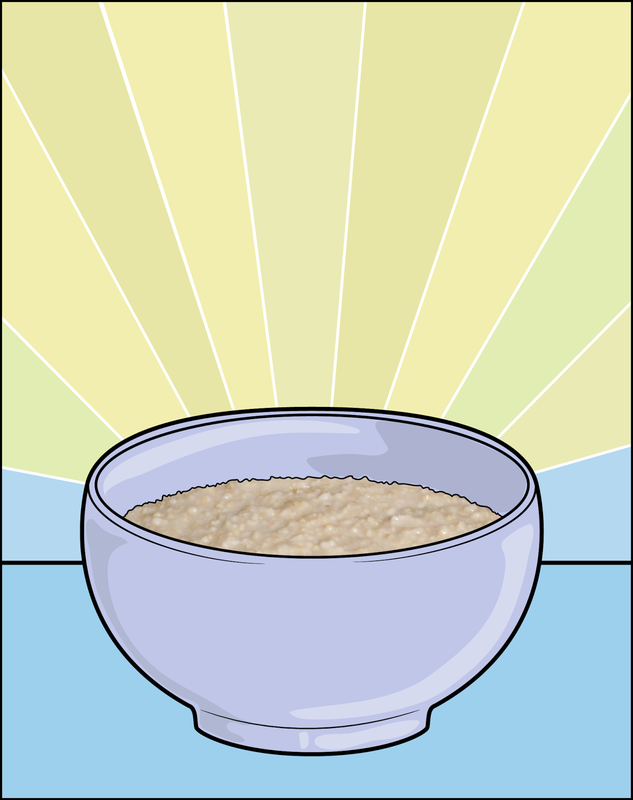 Pour the egg from the pan onto the oatmeal and then, with a spoon, chop it up and stir into the oatmeal. Now you've got an easy, hearty breakfast that's pretty good for you, too! Happy Friday!